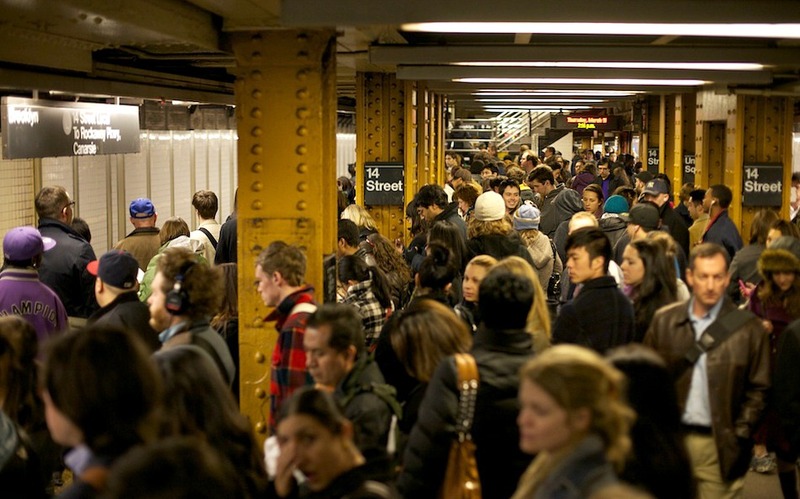 At least we’re getting some validation for our title of “disgruntled New Yorker.” According to a new report called “The Hardest Working Cities” issued by Comptroller Scott Stringer, New Yorkers have an average work week of 49.1 hours, including six hours and 18 minutes for commuting. * And with subway service getting even worse–delays increased 46 percent in 2014–the future of our sanity isn’t looking good. Coming in after New York is San Francisco, where the average weekly work/commute time is 48.6 hours. Other cities include Houston at 48.18 hours, Chicago at 48.01, Philadelphia at 47.02, and Los Angeles at 46.48. Milwaukee fared best with 44.5 hours. It was the commute that sent New York to the top of the list, as we’re the only city where the time getting to and from work exceeds six hours. The actual time working of 42.5 hours is pretty much the same as the national average of 42.25 hours. As we know, the subway carries the most New Yorkers–a whopping 6.1 million riders a day, 1.5 million of whom are full-time city workers–and these commuters spend an average of 7.51 hours a week riding the train. Those who use the ferry, like Staten Islanders, have it even worse, spending 11 hours each week schlepping back and forth from the office. This is among the longest commute times in the entire country. According to Stringer, this should serve as the push the city needs to make added investments in transit. “To compete in the 21st century, we need to expand our transit networks and advance policies like flexible work arrangements and predictable scheduling,” he said.